1948 Rolls-Royce Silver Wraith Park Ward Saloon, #WCB45. It was delivered in January 1949 to Mr. E.W. Collinson from Halifax, Yorkshire, in the United Kingdom with registration KLE790. This Silver Wraith has had a major service. Above that the next maintenance has been performed: the oil filter replaced, spark plugs replaced, twinset contact-breaker points replaced, valves adjusted and seals replaced, everything adjusted en tuned, exhaust system replaced, brake drums demounted and everything checked, cleaned and adjusted, brake hoses replaced, the master cylinder overhauled, Brake fluid replaced and brake system bleeded, front supporting arm rubbers replaced (“tennis ball”), gear box rubber replaced, gear box tie rod rubbers replaced, gearbox support rod rubbers replaced, radiator cap replaced, rear shock absorber rubbers replaced, temperature and oil pressure gauge overhauled, complete leather interior overhauled. 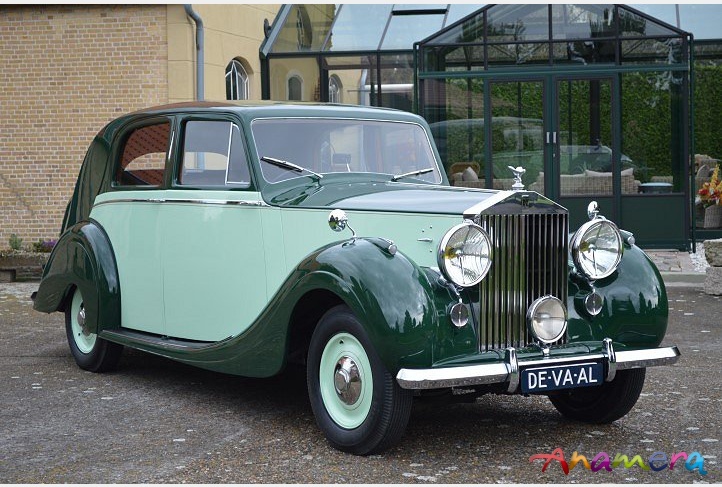 The Rolls-Royce Silver Wraith #WCB45 was delivered in January 1949 to Mr. E.W. Collinson from Halifax, Yorkshire, in the United Kingdom with registration KLE790. Mr. Collinson, born in 1879, was the owner and general manager of T. Collinson & Sons Ltd. a famous tea and coffee purveyor which was established in 1835 in Halifax. Unfortunately Mr. Collinson, who previously had owned a prewar Wraith, couldn’t enjoy his new car very long. He fell off a 200ft cliff near Scarsborough, while on holiday in August that year. After his death the car was kept by the firm until sold in 1953 to Mr. G. Oldroyd. After that little is known of the history. In the eighties it was owned by Mr Foster from the USA. Then it came to France in 1997 and in 2001 the car was bought by a Dutch enthousiast. It has resided in The Netherlands ever since. The car was build by Park Ward to design number 45, their standard four door saloon with manual gearbox, without division of which a total of 62 cars were produced. Finished in two-tone Green this Silver Wraith is in a very nice overall condition, with the original full Brown leather interior complemented with Brown carpets. It has a full size sliding sunroof and comes with the RREC chassis card. Having a relatively small body for a Silver Wraith and not having a division, this is the ideal owner driver car.